Three reviews of a wonderful book for the TES published last week. This is a great coming-of-age book: first love, first kiss, adventure, exploration and those memories you revisit over and over again when you’re falling in love for the first time. The only difference is this is the only recent memory that Flora has – her first kiss – and it is revisited over and over again because Flora suffers from anterograde amnesia. Normally she can remember very little from her real life as a 17-year-old girl (her memories end at 10 years old) but this kiss has jogged something, unlocked something, and surely that means it is worth something? Surely that means this kiss must be the Romeo and Juliet of first kisses: it is magical, it is meant to be, it must equal true love. This is a love story written to the teenager you remember being, and it is beautifully written. It is compelling and keeps your interest to the end. 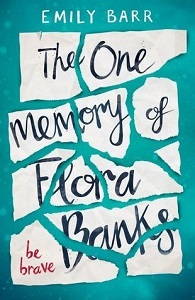 The fact that Flora has only this one memory doesn’t distance her from other teenagers or from her teenage readers: we all become a little fixated under the spell of first love: real life is put on hold, and we indulge ourselves in another secretive world that has been created between just two people. In this case, a very secretive world, as the boy whom Flora remembers kissing is Drake, the boyfriend of her best friend. Even though Flora is a teenager with an unusual condition, Emily Barr perfectly evokes universal themes. The reader shares the same sense of vulnerability as Flora: the danger that comes at every turn from a life where you do not have the confidence of knowing what has just happened – Flora has to prompt herself with messages on her hands and arms – and the same sense of hope: that she will get to kiss Drake again. Barr’s simple writing style – the story is told in short, often naive and startling honest sentences – is beautifully effective. Flora has to order the things around her – in her head, in her life – in simple ways, and filter straight through to the important things. She has no time to indulge: she has to state the truth as she sees it. Other characters are reflected through her eyes as they move in and out of her life and her short memories in an almost dream-like way. Somehow this narrative makes for the most wonderfully atmospheric, quiet and calm descriptions of nature – rather like a stark black-and-white photograph of sea or snow, or an Alfred Wallis painting. I loved being inside Flora’s head when she was standing by the sea in Cornwall or in the arctic tundra – I felt the expanse let me breathe in cold, clean air after being stuck in that one memory inside Flora’s claustrophobic family home. Michelangelo described stone sculpture as the slow release of a form as it emerged out of the marble block excavated from deep in the mountains of Cararra. He said that it was his job as an artist to liberate the human form trapped inside the block by gradually chipping away at the stone – that the statue was already inside, and he was just releasing it. I love that notion dearly, and I get the same feeling from this book: that there are wonderful things written in the stars for Flora, but she has to chip away to release them from this memory-limited prescription-drug-induced fug she is trapped n. She needs to be allowed – by adults – to fail, to explore, to experiment, and to put herself in harm’s way, because she deserves a life of her own creation: just as all teenagers do. One is often filled with a sense of sorrow at just what a wonderful life a girl like Flora could have if she did not suffer from her condition, but it is comforting that her memory has seized on one wonderful moment of being. I think teenage girls will adore this book – will make friends with Flora, and hold tightly to her graffitied hand for every step of her journey. Except, of course, when I rode “into the valley of Death”, I was not one of the six hundred, but alone. I was not looking forward to it – the blurb screams “issue book” (which I have ranted about before), and the cover is downright depressing if you think about it. However, I am learning. I have even begun to say “literary appraisal” instead of “criticism”, and I pledge to be balanced and rational. Honest. I tried very hard to find the set-up plausible, because after all, this is another young-adult novel with much the same story and message as the others. It tells the story of a 17-year-old trapped inside her own head. The only original thing about it is the reason why: anterograde amnesia. I suppose we should start at the very beginning, which we all know is a very good place to start, particularly when unpicking stitching. Conventionally, the story starts with a heroine, (or hero, but the girls go first in my book). The problem I found with Flora Banks is that her confusion is confusing. She doesn’t really know who she is. Neither do we. If a heroine is not self-assured then how is she inspiring? That’s like Jane Eyre without her parting speech (“equal — as we are!”) or Elizabeth Bennet saying “Maybe” when Darcy proposes. Perhaps the inspiration in Flora is supposed to be how she copes with her illness, except she doesn’t cope. As the days go by, she defines herself more and more by other people. She has no character to speak of, outside her all-encompassing amnesia. I wonder, is it only me who feels young-adult novels present love as an evil, or at least stronger in the presence of it? There is something double-edged about a kiss starting the restoration process of Flora’s memory. Of course it’s a beautiful idea and the basis for a wonderful love story, but this isn’t a wonderful love story. It’s an issue book about love, which are not the same thing. I am not going to say that this book is badly written, because I don’t think it is, but I do think it’s a bad book. I’ll admit that Flora’s brother Jacob was moving, and almost made me cry. He was one of the only half-decent and inspiring people. I say people because that’s what issues books are about – people and problems. This, though, is what they so often get wrong, and why I don’t like many of them. They mistake “people with problems” for “problematic people”. In case all the alliteration is clouding my point, I just couldn’t enjoy a book which dampens down all its own characters and ideas. The plot was largely implausible and I frequently found Flora remembering or not remembering things that were wrong in line with her original diagnosis. All of this said, Emily Barr had set herself a hard task. To write a heroine who doesn’t know her own mind has never been done before. At least not quite like this. Flora’s repetition of “I am seventeen”, “I kissed a boy,” “I’m Flora Banks” is, I suppose, trying to show her memory loss, but the fatal flaw is that we are told that inside her head she is 10. And she was normal at the age of 10. Emily Barr clearly doesn’t know any 10 year olds. I do. They don’t talk, act, or think like that. The plot itself was depressing but more so was the feeling when I finished the book: tired, drained, and still sitting listening to the rain, but now in bed. And into the valley of death rode I.
Flora Banks is one extraordinary girl! Whether she is walking around her own home discovering her own things for the first time (again), or pursuing her one true love in a passionate flurry of emotion, she never fails to entertain or evoke sympathy – her innocent and naive approach to life makes sure of that. Yet, beyond the comforts and restrictions of her own home, this girl has a strong impulsive nature that is unleashed when confronted with exciting new experiences and people to share them with. We see this contrast of character as she abandons her pills (which deliberately send her into a drugged up and foggy mental state). She has escaped from a life wrapped in cotton wool, where exhilaration or thrills were completely inaccessible. Having a first kiss, and remembering it also, offered a new lease of life for Flora, which she grasped with both hands, realising how liberating it is to feel such sensations or, more precisely, to feel ALIVE. This book addresses a condition that is common to many people and affects their lives dramatically. Amnesia is not only difficult for those who suffer from it, but for those who are a part of the sufferer’s life but have become estranged – unintentionally – from their world. It is an isolated island at times, that is hard to reach and painful to discover. In this book, a particular variation of amnesia is explored. Instead of being constantly confused, Flora is given memories, and they are taken away again within a matter of hours. The only ones that have stayed with her were prior to the accident. To attempt to touch on such a topic – sensitive to many people – is tricky, especially as it requires unstitching the complicated thought processes of a brain unique compared to others. To achieve this, the writer repeats the regular recollections of Miss Banks every time she wakes up to read her life story, or her messily tattooed arms. This became an annoyance to me, as I found she was kissing Drake again – this time in chunky boots and a blue dress. One memory became an obsession! This was when I was inclined to skip a page; still, I was faithful and hung on. Another thing that puzzled me in the latter chapters was the flitting to and from a sort of dreamland, which became merged with reality; I felt it was disruptive and found I was to question whether she was asleep and what time it was. Similarly, the passages where she would drift off to the ceiling or the clouds and watch herself felt a bit off-piste. At the end when she meets Drake and Nadia, the emails are unfolded and Drake insists that Flora wrote them of her own accord, then throws Flora into a state of further disconcertment by saying he kissed Lily not her. This works well, as it shocks the reader. When the summit of the book is reached, as Paige tells Flora that she’s coming off her pills, she explains for the first time (the second time is in her letter) what really happened the night of the farewell party: Lily photographed the kiss between Drake and a certain blonde 17-year-old girl, in a white dress and yellow shoes which she doesn’t like. So Drake lied about the kiss, but the legitimacy of the correspondence was left unexplained. Perhaps Barr intended for it to be left, or maybe it was self-explanatory. I can’t decide. Finally, the ending draws the indefinite conclusion that Flora (the now officially ADULT version) agrees to escape from her padded cell of a home, to be studied by neurologist, Dr Joe Epstein. To me, the ending doesn’t satisfy, but that may be the sign of a good book. I cannot deny that it is a well-written and insightful interpretation of life with this disease. I feel it needs a sequel – or perhaps this will be the first of a trilogy, so that the many questions that are posed at the end of this book may be answered. For example: will there only ever be one memory of Flora Banks? Delighted that Malkin Moonlight has been selected for the 2016 – 2017 long list by the people of Waverton for their annual children’s good read award! Using original illustrations by Rohan Eason, and a signed book from the author, a small corner has been created! Her annual target in 2017 is to read a book every week in the #readathon17 challenge. She will read at least one Tolstoy novel and a small cat book. This year, TES started a series of weekly pupil-written reviews of books for children. Here are the 10 that most impressed our classroom critics. Children’s books do not get much attention from newspapers and magazines. So, in February, a group of children’s authors, led by SF Said, set up a Twitter campaign using the hashtag #CoverKidsBooks. The aim was to encourage newspapers to increase and improve their review coverage of children’s books. TES responded almost immediately. We’d been talking about setting up a children’s book-review page on our website for a long time, and this was the incentive that we needed. We asked teachers to review books, but we didn’t simply want adults to give their opinions; this seemed to miss the point. Surely it would be far more effective to ask children to review books that were intended for their eyes. So that’s what we did. Here are 10 books that our reviewers − both teachers and students − loved this year. A book about…a clumsy 13-year-old boy called Kevin, who is mistaken for a secret agent and ends up getting armed with an arsenal of James Bond-style gadgets to tackle a supervillain. A book about…a young German boy living in Nazi Germany between 1936 and 1945, and how a Polish boy challenges his dedication to the Hitler Youth. A book about…a young Polish girl who is led away from the danger of the Second World War by a mysterious man, who is known as “The Swallow Man”. A book about…a small black cat who falls in love and then battles to bring peace to a recycling centre full of other cats. A book about…a bird, closely modelled on the actor of a similar name, who saves Beach City from all sorts of miscreants. “Across the board, the children scored this 10/10 on their hands. A book about…the power of curiosity and a child who opts to use science to understand the world around her. “I enjoyed this book, because it made me appreciate all of the scientists’ hard work. A book about…Lydia, a girl who falls for a soldier and follows him to Brighton where she tries to find out what she really wants from life. A book about…a girl who suddenly starts creating doubles of herself, and the ensuing chaos that it brings. A book about…a boy and a baby dinosaur and their adventures at Christmas. A book about…an orphan who is drawn into a world of monsters and knights, one in which the true story of where he comes from is buried under half-truths. This is an edited version of an article in the 2 December edition of TES. Subscribers can read the full story here. To subscribe, click here. To download the digital edition, Android users can click here and iOS users can click here. TES magazine is available at all good newsagents. Jess from Deri View Primary School is the delighted winner of Bloomsbury’s writing competition. Congratulations and well done! A big well done to Jessica Withey in Year 6 who won the Bloomsbury’s Malkin Moonlight creative writing competition with her brilliant entry about a fox! Jessica wins a Kindle Fire and a bundle of books as well as £100 of books for our school!